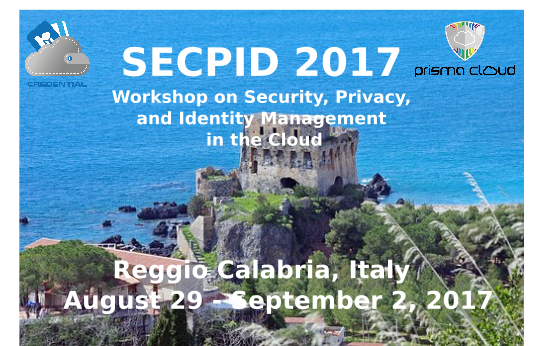 PRISMACLOUD and its partner project CREDENTIAL are organizing a Workshop on Security, Privacy, and Identity Management in the Cloud at this year's ARES conference, the 12th International Conference on Availability, Reliability and Security on August 29 - September 2, 2017 in Reggio Calabria, Italy. * How can cloud services be made more trustworthy? * How can we build distributed systems without single point of failure or trust? * How to design end-to-end secure services in an untrusted environment? * Which methodologies and technologies are required to integrate security and privacy by design? * Is it possible to give back users full control over which data they want to reveal when and to whom? The call for papers as well as the submission guidelines can be found >> here <<. We are looking forward to your submissions, and interesting and fruitful discussions during the workshop sessions! About CREDENTIAL: CREDENTIAL aims at developing privacy friendly means for storing and sharing personal data in the cloud, and at realizing an “identity and access management as a service” system supporting publicly certified identity data.